It’s not really the Carlsbergesque slogan that Northern Ireland would welcome, but a new official series of statistics released today by Sammy Wilson’s Department of Finance and Personnel shows that residential property prices in Northern Ireland are down 53% from the peak in 2007 and fell by 3% alone in the second quarter of 2012. These are the nominal headline figures, and on this side of the Border in the Republic, the equivalent figures are 50% and 2%. However, when you factor in inflation for the UK (including Northern Ireland) of 16.1% from the peak in Jul-Sept 2007, and compare that with inflation of just 1.7% since the peak of Sept 2007 in the Republic, the real decline in Northern Ireland is indicated to be 59.5% compared with 51.1% in the Republic. Which is surprising enough, but compare this with the world’s worst property crashes – as measured by real declines in value from peak – and it seems that Northern Ireland is the record holder, the Usain Bolt, the gold-medal Olympian of property crashes! The figures published today are worse than the quarterly survey figures produced by the University of Ulster in association with Bank of Ireland, even though we still haven’t seen the Q2, 2012 results from the University. The probable reason for the discrepancy is that Sammy Wilson’s figures today are based on ALL sales recorded by UK tax authorities including auctions where you are likely to find repossessed/foreclosed property which might be sold under distressed conditions. The University survey is based on estate agent sales which would tend not to be distressed. Also Sammy Wilson’s results examine all sales totalling about 3,000 per quarter, whereas the University only looks at about 1,000 per quarter. Elsewhere the results published today show that there were 2,962 “verified” residential property transactions in quarter two, but this is in line with the circa 3,000 recorded in the last four quarters. In other words, prices are falling and transaction levels are staying the same. On this side of the Border we seem to have two factions of commentators, the “Bottomists” saying that prices are at the bottom or at least stabilising in some areas and the “anti-Bottomists” saying that prices are still falling. But when you consider the fact that Northern Ireland has a residential property vacancy level of less than half ours (14.7% versus 6.4%), they have their own bank, the Bank of England which didn’t allow credit to balloon in the same way as the ECB did in the Republic, their net migration in 2011 was nil whilst ours was 34,100 of net emigration, and their unemployment rate is 7.6% versus our own 14.8% though their local economy doesn’t seem to be growing any more than our own, you might conclude that the anti-Bottomists will see their position boosted by today’s publication. Also, there is issue here on public administration. Sammy Wilson’s Department of Finance and Personnel is hardly of the same scale as Minister for Finance, Michael Noonan’s Department of Finance. Yet, it has been able to produce a statistically-sound house price index based on all transactions, cash and mortgage. We might, if we are lucky, get from our CSO next week an indication of the total market – cash and mortgage – or we may not, but the July 2012 index produced will be based on mortgage transactions only. We might, if we are lucky, get from the Property Registration Authority of Ireland a house price database in September 2012, but I wouldn’t hold my breath given the delays to date. Time for Minister Noonan to raise his game. UPDATE: 4th September, 2012. 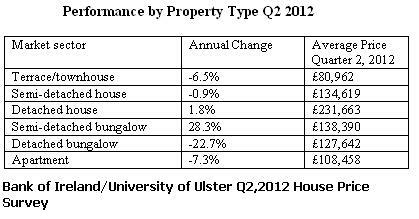 The Bank of Ireland/University of Ulster house price survey for Q2, 2012 has been released this morning. 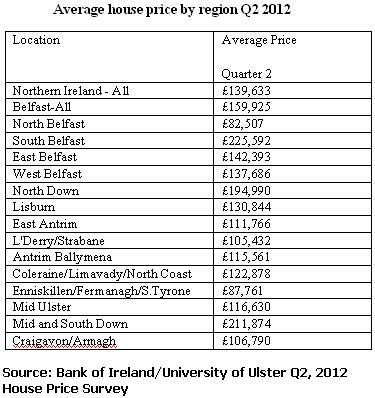 It shows that the price of an average home in Northern Ireland increased by 3.8% in Q2, 2012 from GBP 134,560 (€169,963) to GBP 139,633 (€176,370 ) which means that according to this survey, Northern Ireland residential property is 44.2% off peak of GBP 250,400 in Q3,2007. The survey was based on 931 estate agency reported transactions. Bank of Ireland thinks that residential property has another 5-10% to fall in Northern Ireland. Following the introduction of the new Northern Ireland property price series a fortnight ago by Sammy Wilson’s Department of Finance and Personnel, there will be less attention paid on here to this survey, because Sammy’s series has all sales recorded at HM Revenue and Customs and totals about 3,000 transactions per quarter. It is worth noting that Sammy’s series for Q2,2012 showed prices dropping 3% in the quarter and are now 53% off peak. However this morning’s survey reveals the following for regions of Northern Ireland and property type, prices in pounds sterling. Surprise revelation – the section of Irish society that partied hardest during the boom (40-years and older teachers!). An Taoiseach Enda Kenny might be a little confused about whether or not we did in fact all party during the boom – variously proclaiming that “people went mad” borrowing during the boom but also that “we are not responsible” for the ensuring crisis – but a new report published by the Central Bank of Ireland shows that those over 40 years of age and employed in the education sector obtained the highest average-value equity release loans during the boom period 2005-2007, an average of €76,099 in 2005. In other words, it was mature teachers who partied hardiest and who went on spending sprees using money borrowed on the never-never. Equity release is a term used to describe borrowing secured on the unencumbered value of your home, so if you obtained a €200,000 mortgage to buy a €200,000 home and the home then increased in value by €50,000, you might have subsequently borrowed an additional €50,000 secured on the increased value. Typically in Ireland, the interest rate on equity release loans was 2-4% cheaper than unsecured lending, so you might have obtained an equity release loan of €25,000 to buy a car and pay 3% per annum, but if you obtained an unsecured car loan from the bank it might cost you 5-7% per annum, so equity release lending was obviously popular if you had a house. 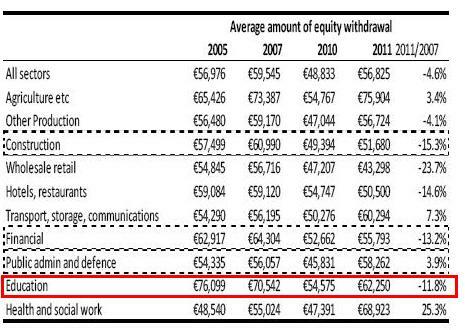 To put the partying in context, for the first half of 2012, banks in Ireland have lent an overall total of €1.1bn for mortgages, mostly to first time buyers and movers, but also including top-ups and equity release. Back in 2006, banks lent a staggering €5.5bn (at least) for equity release alone, and whilst most of it – 91% in fact – was reinvested in property, a significant proportion went on large-scale consumer durables like furniture and cars. And of course there was consumer spending on everything from holidays to handbags. 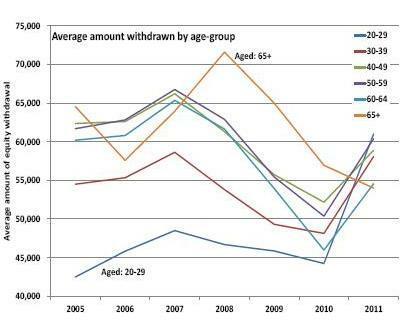 In the property boom peak 2006-2007, it was householders aged 20-29 years of age who worked in Financial Services who were mostly likely to obtain equity release loans, but it was the over-40s working in Education who obtained the biggest individual loans. It should be said that householders working in Education were least likely to obtain equity release loans in the first place, but when they did get them, Boy were they the biggest! Also by 2007, farmers were obtaining loans at the same average level as teachers.